With figures from the Packaging Federation estimating that the industry employees around 85,000 people in the UK alone, there is little doubt that the sector is at the forefront of product innovation and manufacturing technology, with systems becoming evermore hi-spec and flexible. In one example, Endoline Machinery has assisted Ballygarvey Eggs in operating one of the most state of the art egg packing plants in the country. The installation also saw the end of line machinery specialist design a new system – a random case erector (RACE) – which will boost Endoline’s growing line of flexible high speed machines. With 25 different configurations of egg boxes Ballygarvey needed an automated line which was reliable, high speed and, above all, flexible to deal with the changing demands from supermarkets. 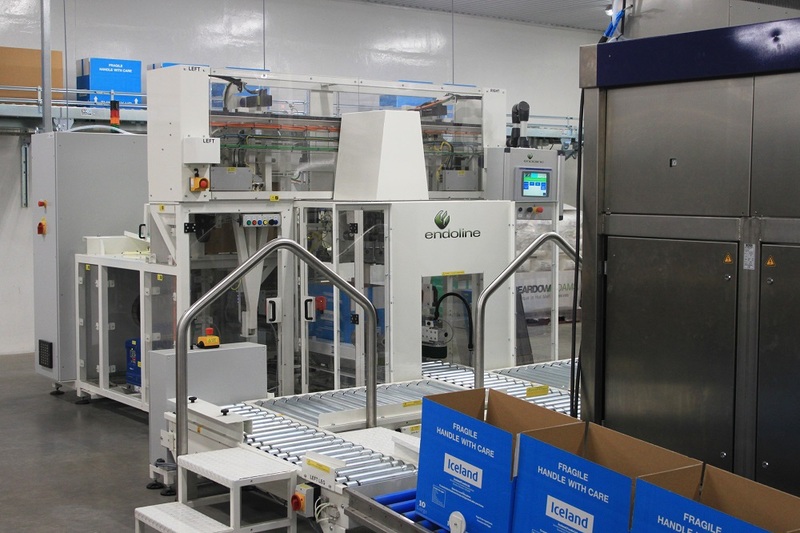 Following global demand for its 744 fully automatic random case sealer, Endoline designed and built RACE - a random automatic case erecting system to boost their SMART machinery portfolio and meet the needs of Ballygarvey. Designed with dual opposing hoppas RACE not only allows for different sized cases to be run at any one time but downtime is eliminated as one hoppa can be re-loaded with cases while the other side continues to operate. Capable of feeding up to three packing lines at any one time RACE also incorporates Endoline’s unique dual opposing vacuum technology, which ensures each case is opened positively to overcome any tearing. 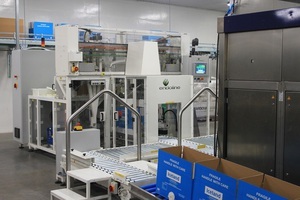 Andrew Yates, Endoline’s sales and marketing manager explains: "Two different case sizes can be run on the RACE system at any one time so each hoppa is loaded with cases – one size per side - and during the packing operation a sensor, fitted to the packing line conveyor, will communicate which case size is required. The RACE then automatically adjusts itself to form the case required and send it down the relevant line - all of this can be completed at a speed of up to 14 cases per minute. Significantly, the time it takes to change or load more cases into a hopper are eliminated as, while one hopper is re-loaded, the other hopper can still be in operation." Once all the eggs, within the new Ballygarvey site, are checked and graded, and packed into egg boxes via Moba systems they are run through one of two packing line types. One is low speed manual operation with workers manually erecting outer boxes and filling them, via six packing lines with egg boxes. 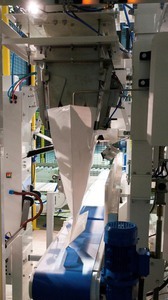 The second line features RACE which feeds formed outer boxes to a further six packing lines, which are operated by robots. However, once all the cases of eggs are filled at the 12 packing lines they all feed into the Endoline 744 fully automatic case sealer – at a rate of 126,000 eggs per hour. Another company to respond to customer demands for faster, more-versatile equipment for use in packaging system is Pacepacker Services, which will launch a new high-speed bagging line called FastPac at this year’s PPMA exhibition in September. The first of the machines in the FastPac range is an upgraded sack placer that can help boost the number of bags packed per minute by up to 20%, offering a new top speed of 16-17bpm. It can also handle an unprecedented range of sacks, including those made from difficult-to-pick-up materials such as hessian and net. This follows a growth in demand for these bags, in particular from its European customers and UK exporters packing bags of produce, pulses, rice and coffee beans in bags weighing 25kg and over. The added versatility and speed makes the FastPac range ideal for bulk solids handling, food packers and contract packers alike. Sack placers take flat bags from a stack and position them ready to be held in place for filling. Most conventional machines rely on suction cups to pick up the bags, but that rules out the use of very porous bag materials such as hessian and net. The newly enhanced sack placer has an option for a system of mechanical grippers so it can handle porous materials in addition to paper and plastics. The FastPac range of sack placers also manoeuvre the sacks in a different way from most of the range, picking them up by the bottom and peeling them off the stack, rather than picking up the top of the bag. This ensures that bags which have a tendency to stick together can be handled more effectively. With this in mind, Pacepacker Services is also upgrading other bagging steps to optimise the overall speed of FastPac lines. For instance, the company can already offer an upgraded Total Bag Control (TBC) system to match the faster speed of the enhanced sack placers. TBCs receive the sacks from the sack placer, holding the top of the bag closed while feeding them into a belt feeder ready for sealing. Pacepacker TBCs use inverters to control the unit’s motors and match their speed precisely. Faster speeds and bigger throughputs make accurate weighing more essential than ever in order to reduce giveaway, so Pacepacker is also using the PPMA show to highlight its allegiance with Dutch weighing specialist PIM. The rewards associated with greater accuracy vary widely depending on the application. However, in one recent project, integrating a multi-head weigher from PIM into a new Pacepacker potato packing line helped the client reduce giveaway from around 0.75kg to just 2-3g per sack. The overall speed of each FastPac line will depend on the other steps in the packing process and the handling characteristics of the products being packed. 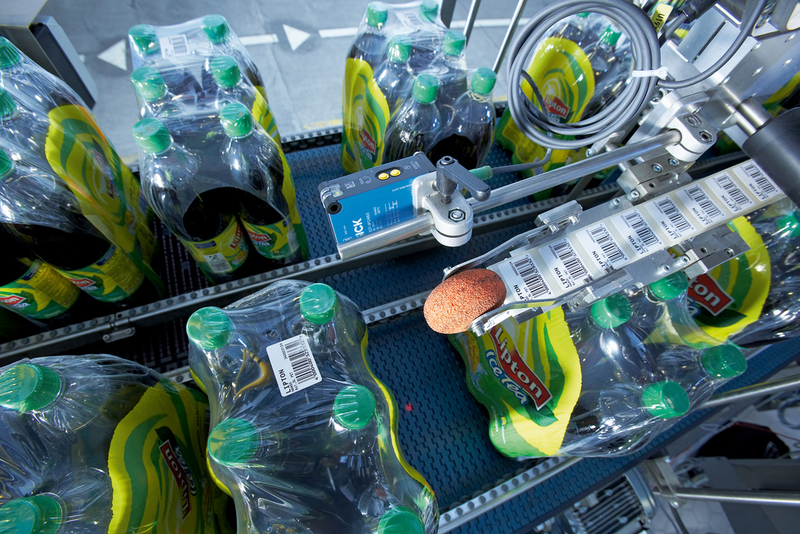 Further afield at a PepsiCo soft drinks plant in Germany an innovative solution from Sick has successfully overcome problems associated with the reliable detection of six-packs in PET foil, which have reflective and uneven surfaces. The use of shrink wrapping as part of automated handling and palletising processes has delivered impressive cost savings and additional benefits of more attractive branding and improved pack quality. 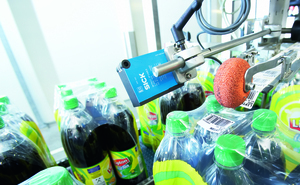 But this progress in packaging automation has created another problem, which – up until now – has proved perplexing to solve: How to achieve 100% efficiency in detection of automated barcode labels. Detecting clear-shiny, dark-glossy or multi-reflective surfaces is a challenge especially where there are complex curved shapes or transparent outlines. Now Sick’s MultiPac sensor has eliminated the possibility of false or misleading signals and achieves highly-consistent detection in multi-product handling applications even when surfaces are shiny, clear or curved. 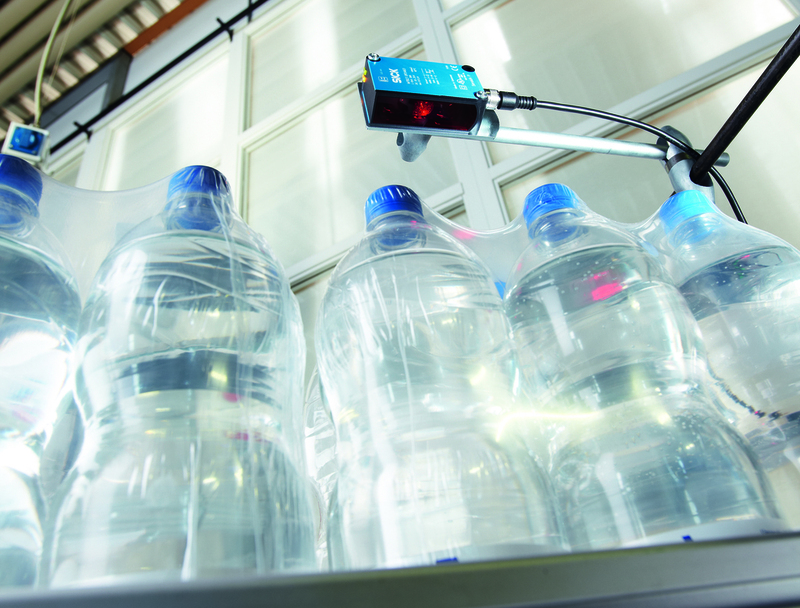 To maximise the efficiency of the shrink wrap station, many bottling plants will feed through different products with a range of sizes and shapes. The requirement for versatility in shape detection can compound the problem as conventional proximity sensors may have to be constantly and individually adjusted. The effectiveness of the Sick Multipac is demonstrated on the labelling systems supplied to the PepsiCo filling plant by Logopak Systeme. The detection error rate was reduced to zero throughout a six month period, eliminating a significant cost. The Sick Multipac sensor has two independent receiver systems. They can offset the brief deflections caused by the uneven pack surface because at least one of the two receivers always captures the reflected light. Additionally, a high-power LED emits high-intensity light so that even faint reflective surfaces are reliably detected. Each receiver system comprises several elements which facilitate a differentiated signal assessment and deliver a more refined result to the common signal processor. Having just two receivers also facilitates SICK’s proprietary ASIC evaluation algorithm, otherwise much greater (and more costly) processing performance would be required to coordinate the two receiver systems. To ensure sufficient light being reflected back to the receivers, the MultiPac benefits from Sick’s PinPoint LED. PinPoint produces a high power, tightly focused spot, without the central unlit portion that characterises earlier LED emitters. With this performance, sufficient light is received to detect a very wide range of different sizes of film wrapped bottle packs on the same packing line. Thanks to a scanning distance of up to 500mm the Multipac enables maximum freedom in positioning and installation, and does not require a reflector. There is therefore no need to adjust the mounting height when different size packs are put on the shrink wrapping line. Like any process, stoppages on any type of packaging line can be troublesome and costly. 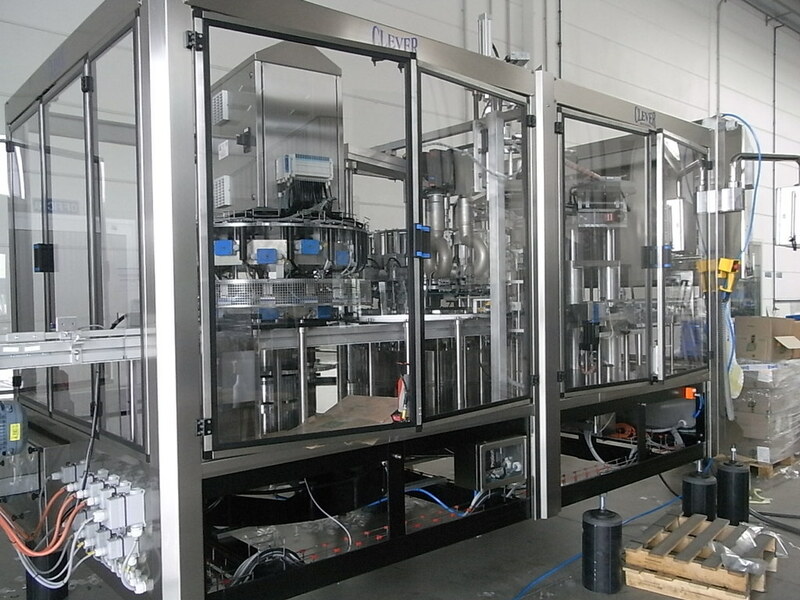 In Altavilla Vicentina, Italy, a Clever Sleever Machine places and shrink-wraps decorative sleeves on bottles at a rate of 18000 pieces per hour, equivalent to five pieces per second. This means costs are high every time product needs to be stopped to replace a damaged or broken slip ring. Clever provides a wide variety of sleever machines and heat-shrink tunnel applicators. The machines can perform every type of sleeve application required by the client, at different production speeds, including linear and rotary machines suitable to apply full and partial sleeves and safety seals. 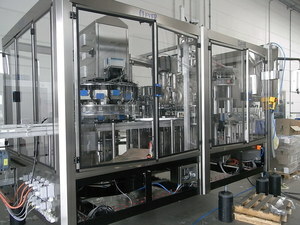 They can be found in many different packaging applications including food and beverage, cosmetics and pharmaceuticals. When a client approached the company with the need to reduce downtime on their Sleever Machine because of the time-consuming nature of maintaining slip rings, Clever contacted Rockwell Automation. Rockwell suggested a ProSoft Technology’s 802.11n Fast Roaming Industrial Hotspot radios and a 5 GHz radiating cable as the antenna. The 802.11n Fast Roaming Hotspot supports Access Point, Repeater, Bridging and Client modes and delivers fast data rates up to 300 Mbps. "The Fast Roaming feature of this radio maintains seamless, high-speed connections particularly well-suited for moving equipment like Clever’s Sleever Machine,” said Andrea Mazzucchelli, regional sales manager for ProSoft Technology. Now a CompactLogix L36, communicates to the Point I/O through ProSoft Technology’s radios, providing fast and reliable data from their rounding tables which apply the label and heat-seal them to the bottles. The radiating cables essentially replace the slip rings, virtually eliminating the expensive downtime associated with maintaining them. A radiating cable is a long, flexible antenna with slots to radiate RF signals that can be installed around corners, along monorail systems and through tunnels to propagate wireless data signals in situations that are tough or impossible for traditional antennas. Since the radiating cable antenna can be mounted within inches of where the signal needs to be received, it isolates the wireless signal from going to other machines that may be on the plant floor. The cable comes in multiple lengths to meet the needs of most applications. What does maintenance mean for aerospace? DTC or FOC - which is better?